Harry Potter fans will love this amazing Harry Potter pop-up book. Actually titled Harry Potter: A Pop Up Book Based On The Film Phenomenon, it is based on the Harry Potter movies rather than the books. This book was created from the artwork of Andrew Williamson, a man who worked on the artwork for all of the Harry Potter movies. The man in charge of actually designing the pop-ups was Bruce Foster, who has at least 40 pop-up books to his credit. For fans of the entire Harry Potter franchise, this book will be a trip down memory lane (or at least down Diagon Alley.) You will also get to visit Hogwarts Castle and a Triwizard Tournament. I love the fact that, through the magic of YouTube, you can take a look into the pages of Harry Potter: A Pop Up Book Based On The Film right here on this page. So what do you think? Isn't this an exciting book? Buy this Harry Potter pop-up book from Amazon. 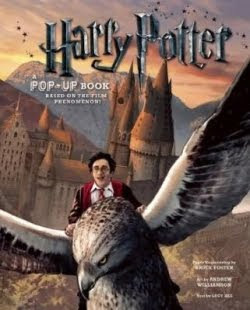 Read more about at Harry Potter Pop-Up Books and Calendar. If you are planning a party to coincide with the release of the final Harry Potter movie, I have a few resources for you in terms of finding some great Harry Potter recipes. If it is Harry Potter's butterbeer you are after, you should check out What Is The Best Recipe For Harry Potter Butterbeer and, if you are like me, you would LOVE to buy some of these butterbeer steins from the Wizarding World of Harry Potter to serve it in. If it is Pumpkin Juice you are after, you should visit What Is Pumpkin Juice where you will find more information about this Harry Potter drink and some recipe links. I was surprised to see that you can actually by a Kindle book called Butterbeer Recipes on Amazon for under $4. The final and perhaps best resource for recipes for your Harry Potter party would be The Unofficial Harry Potter Cookbook. It is a lovely hardcover book packed with recipes for many of the treats you have learned about over the years in the books. Naturally, it features chapters on everything from Delights Down Diagon Alley to Treats From The Train to Recipes From a Giant and an Elf. I am certain you will find all the recipes you need to create a feast Harry Potter style for your Dining Hall. What Is The Best Recipe For Harry Potter Butterbeer? Order your copy of The Unofficial Harry Potter Cookbook from Amazon. Last night we watched the 1982 version of Tron, which Disney calls TRON CLASSIC. Some might argue that it is not really a classic movie, and I’d agree, although at least now we can stop calling it the first Tron movie. I’m not sure what I expected but I guess I would say a dated movie, and it was that. Most notable for me were the uniforms worn by the characters inside the computer. However, a few minutes after they donned the suits, they seemed okay or right to me. And I have to comment on the eyeglasses. Did people really wear eyeglasses that were that big in the 1980s? The critics received Tron in 1982 with mixed feelings. They liked the cinematography and the acting but not the plot. If you go into this movie knowing that the storyline is not its strong suit, you will be well prepared. It is supposed to be about good versus evil and it is but it really stands strong as a movie about style rather than substance and that’s okay, too. As a matter of fact, I would say that works for Tron Legacy as well and remember: the original Tron movie was considered state-of-the-art in its day. Blu-ray.com calls Tron Classic a trip down memory lane. The movie itself is not without its faults they say, but the blu-ray transfer is very well done and worth viewing. Buy Tron: Classic from Amazon. If you are interested in seeing both movies, it is worth buying Tron: Classic and Legacy bundled together from Amazon. Read my complete review of Tron: Classic. Are you having or hosting a Harry Potter movie marathon? I have heard rumblings around my house about having one although I'm not sure if it will happen or not. The 17-year old who proposed the idea is keen and he did once live through a Lord of the Rings movie marathon so it is not impossible although likely improbable that he will do the same with HP. I have been reading a story from 2010 about Moira MacDonald, a lady who writes for the Ottawa Citizen. 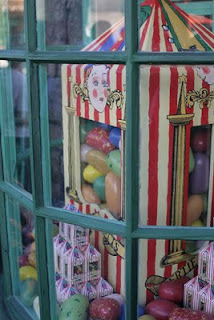 She held a HP movie marathon before the release of Harry Potter and the Deathly Hallows, Part 1. It took her about 15 hours to make it through all six movies, allowing about 10 minutes as a break between movies. 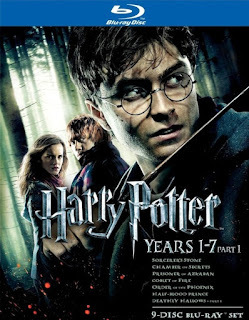 Of course, if you are contemplating a Harry Potter marathon now you will have to add the latest Harry Potter movie -- Deathly Hallows Part 1 -- or about 146 minutes making the total time for a Harry Potter marathon excluding the next and last Harry Potter movie a whopping 17.5 hours. And yes, if you want to buy all of the movies released to date, they are available together in a boxed set called Harry Potter Years 1-7, Part 1, which is shown here. Amazon has the set on sale at almost 40 percent off and will ship it to you for free. Buy all of the Harry Potter movies in a convenient and economical boxed set. Harry Potter and the Half-Blood Prince movie review. 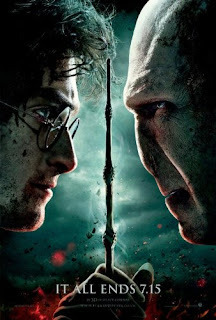 Of course, if you are awaiting the release of the next and last Harry Potter movie, you can satisfy yourself by either reading the book again or by watching the official movie trailer right here on this page. I would never suggest you read all the Harry Potter books again or rewatch all of the movies, although my husband rewatched them all before the release of Deathy Hallows Part 1 and there is talk of a Harry Potter movie marathon around my house right now. 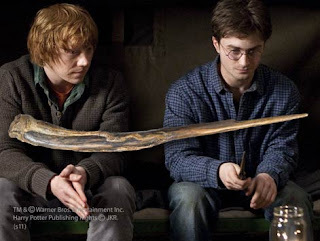 The purpose of this post is simply to share with you the official Harry Potter and the Deathly Hallows Part 2 trailer. "The Epic Conclusion of the Worldwide Phenomenon." Buy The Harry Potter book giftset in paperback or hardcover on Amazon. Buy The Harry Potter Boxed Set, movies 1-7, on Amazon. Wondering when the last Harry Potter movie comes out? Are you tired of waiting? Or maybe just plain excited? I am tired of waiting and excited about the next movie and yes, I even know when it is coming out and will share that information in a minute. First, I want to add that I am also nervous and somewhat concerned about the fact that this will be the LAST Harry Potter movie, ever. I do not think that I will be crying at the end of the last movie but you can be sure that a lot of people will be sad and that the tears will flow because the last movie represents the end of an era. My boys grew up with Harry -- first with the books and then with the movies -- and while they were less enthusiastic about the movies, they are still an important part of the Harry Potter franchise. To honor the last Harry Potter movie, I am planning to run a small group of features dedicated to all things Harry Potter. I hope you will bookmark or follow my blog and enjoy the fun. How about you? What are your thoughts about this being the last movie? Are you excited or could you care less? Buy this poster and see Amazon's complete collection of Harry Potter and the Deathly Hallows merchandise. Hallmark Hall of Fame movies have been around for 60 years and been broadcast on stations like NBC, PBS, ABC and most recently, CBS. 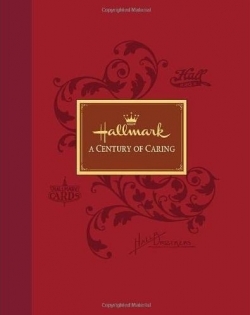 CBS was actually Hallmark's home for 16 years. I was sorry to discover this month that CBS has ended its association with Hallmark Hall of Fame. This means that Hallmark's movies no longer have a station to air on on network television and that movies that we were able to watch even though we do not receive the Hallmark Channel (like Beyond the Blackboard and The Lost Valentine) will no longer be available to us. There is a glimmer of hope in that Hallmark is reportedly trying to find another channel for its movie franchise. Let's keep our fingers crossed. Twenty-five years ago The Oprah Winfrey Show had humble beginnings in a roller-skating rink located in Chicago. A 32-year old black woman who had broadcasting experience and, possibly more important, AMBITION, won a position on a talk show. She went on to turn that talk show into a force to be recognized and today that empire includes the worlds of movies, plays, books, documentaries, magazines, radio, spinoff shows and, most recently, a brand-new television network called OWN. I don't think, however, that anyone could argue that she entertained and she taught. She made people laugh and she made people cry. I myself was quite excited recently when Johnny Depp shared her stage. In the future Oprah will be sharing from behind the scenes of OWN. My guess is that she has a lot of interesting projects up her sleeves. How about you? Do you remember any of the first Oprah Winfrey shows? Were you an Oprah fan? What memories has Oprah given you? 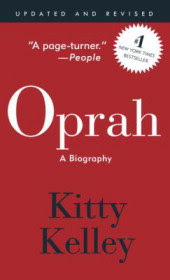 Read more about Kitty Kelley's controversial Oprah: A Biography. See Amazon's collection of Oprah Winfrey biographies. Whether you are an Oprah fan or not, you cannot help but have heard some of the media buzz about the last Oprah Winfrey show ever, which is bearing down upon us very quickly. Thirteen thousand people attended an event called Surprise Oprah! A Farewell Spectacular last Tuesday for the filming of the final show in Chicago, which, by the way, is where Oprah's show had its humble beginnings. The celebration included a look back at the last 25 years of Oprah's show and included the likes of Will Smith, Tom Cruise, Beyonce, Katie Holmes, Maria Shriver and Halle Berry. The last show? It airs this Wednesday, May 25th, 2011 and might be an interesting one to check out if only so that you can say you saw THE LAST OPRAH WINFREY SHOW. 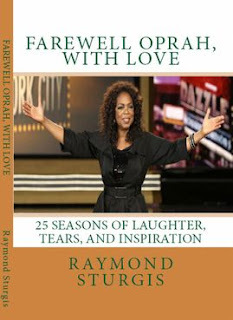 Order Farewell Oprah, with LOVE: 25 Seasons of Laughter, Tears, and Inspiration from Amazon. The new series is to appear on ABC. They 'ordered' Charlie's Angels to begin on May 13, 2011. The plot looks much the same -- three young and attractive female private investigators in Miami taking directions from a boss named Charlie who we never actually meet who is assisted by Charlie's loyal man, John Bosley. The Angels this time include a Park Avenue princess turned thief named Abby who is played by Rachael Taylor, a police detective turned dirty cop named Kate Prince who is played by Annie Ilonzeh and a former street racer named Eve who is played by Minka Kelly. Charlie Townsend is voiced by Robert Wagner and Ramon Rodriguez is played by John Bosley. Interested in reading more? You can find the official Charlie's Angels website right here and for all the latest updates, you can join the new Charlie's Angels Facebook page here. Meanwhile, you can watch the new Charlie's Angels 2011 trailer right here. Be sure to let us know what you think. Were you a fan of the first Charlie's Angels series? The movies? Does this television show appeal to you? 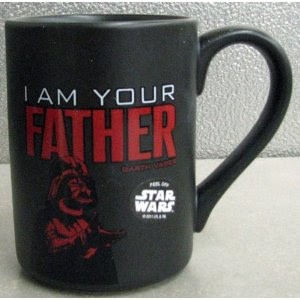 Dads who love Star Wars know very well who Luke Skywalker's father was and now they can celebrate that memorable movie moment with a mug. If you don't know who he is, I don't want to spoil the story and tell you but I will tell you that it is an EXTREMELY important Star Wars movie moment, which I think makes this Hallmark mug absolutely PERFECT for any dad who loves Star Wars on Father's Day. It's a very famous scene, the one between Luke and his father. His father says, "No. I am your father." and the viewer is flabbergasted. Who knew? Who even expected? Not me, that is for sure. Of course, it would be great if you could add the Star Wars discs on blu-ray to his movie collection but alas, you'll have to wait until September 16, 2011, to do that. I see that they will be releasing all of the movies on blu-ray at that time and that there will be three three Star Wars blu-ray boxed sets -- Star Wars: The Original Trilogy, Star Wars: The Prequel Trilogy and Star Wars: The Complete Saga, containing all six discs. I can guess, already, that that last set will appear under a Christmas tree around my home next year. My 17-year old recently said, "Why are we watching STAR WARS on VHS?" For now, the Dad around here will have to make do with the mug, which has become hard to find. You can look for it on Amazon by clicking right here and on eBay by clicking right here. Alternatively, here are a few I Am Your Father mugs that are available on eBay right now. More Star Wars coffee mugs. The Oprah Winfrey Show: 20th Anniversary Collection is an intriguing six-disc look at the first twenty years of Oprah's television program. In this set you will see what Oprah has to say about some of the guests on the Oprah show. Hear her candid thoughts. Learn about the beginnings of the show. Hear about she calls her 'light bulb moments.' Watch as she interviews the likes of John Travolta, Julia Roberts, Barbara Walters, Bill Cosby, The Judds, Madonna, Halle Berry, Michael J. Fox, Beyonce, Chris Rock, Celine Dion, Jim Carrey, and Bono. See Oprah's makeovers and visit her home. This is a 2005 DVD boxed set, relevant and fascinating for anyone interested in Oprah since it is packed with insight into the world of one of the most popular and richest women in America. 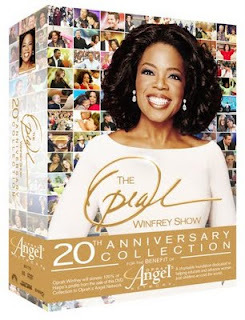 If you love Oprah, you should check out The Oprah Winfrey Show 20th Anniversary Collection. As an added bonus, when you buy this DVD set, you will be doing a good deed since the profits go to Oprah's Angels Network. Order your copy of The Oprah Winfrey Show 20th Anniversary from Amazon. Read about some of the fascinating guests who have appeared on Oprah's show.